Work started at the weekend on major bridge works near Carfin in North Lanarkshire that will allow construction of a new section of dual carriageway to be constructed beneath the line. 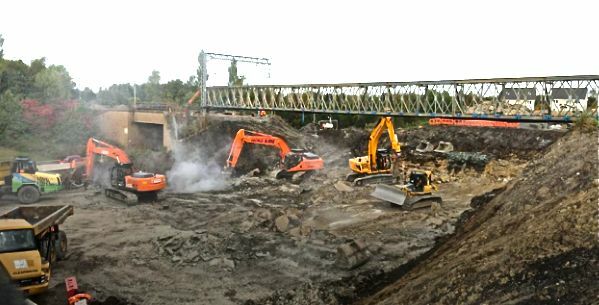 In what Network Rail describes as “an intensive nine-day period” engineers are working around the clock to remove the existing bridge and embankment, install a longer pre-fabricated structure and then reinstate the railway. The work is being carried out by Network Rail as part of North Lanarkshire Council’s dualling of the A723 between Carfin and Holytown. The structure will enable two lanes of traffic on the new southbound carriageway to pass below the railway. Picture from contractor BAM Nuttall shows a fleet of excavators and dumptrucks preparing the site. The main bridge installation works will last until September 29 when the line will reopen. For road users, temporary traffic lights will be in place on the A723 until September 30 to safely manage the volume of construction vehicles accessing the site. Elsewhere, Network Rail last month awarded framework contracts worth £100m for building and civils work in Scotland. The suppliers will be involved in earthworks, bridges, tunnels, footbridges and station buildings and each contract has an option to be extended. Rob McIntosh, regional director of infrastructure projects at the rail company, said: “These new frameworks represent a significant commitment by suppliers, allowing us to work closely with them so that work can be carried out more quickly and efficiently. The successful companies are QTS Group (for earthworks), Amalgamated Construction (structures), Taziker Industrial (structures repairs), and Story Contracting (buildings).